Cheap U.S. shale gas production could deliver massive spill-over benefits to the U.S. chemicals industry. As Citi analyst P.J. Juvekar highlights, cheap natural gas will make U.S. chemicals companies cost competitive against just about everyone except the Middle East. If shale gas proves its promise, the US chemical industry stands to benefit tremendously through: 1). low secular natural gas prices for energy consumption, and 2). low NGL prices relative to naphtha for ethylene feedstocks. Given ample US natural gas reserves and associated NGL production, the current US cost advantage over Europe and Asia is likely to continue. Some European and Asian (Japanese & Korean) capacity would have to be shuttered to adjust for the new Middle East ethylene capacity. The US has been more proactive in capacity rationalization, shutting down ~1.6mmt in 2009 (5.5% of capacity). As a result, US ethylene derivative exports should continue. Given new shale gas innovations and ample US natural gas supply, chemical assets in the US could maintain a production advantage relative to other parts of the world (excluding the ME). Historically the oil-to-gas ratio has been 9x, but has increased to approximately 17x currently due to lower natural gas prices and a recovery in oil prices (see Figure 1) [not shown]. The direct result of the high oil-to-gas ratio is that lighter feedstocks (ethane, propane, and butane) become advantaged. In 2009, the oil-to-gas ratio increased to well above the historical average. As a result, the US chemical industry used an even larger percentage of lighter feedstocks. 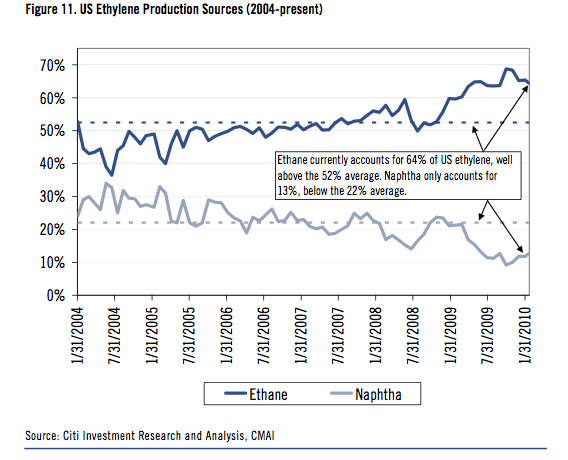 Simply put, U.S. producers can use a higher than average proportion of natural gas-derived feedstocks, such as ethane, when producing the chemical ethylene. There are many ethylene crackers in the US that are “flexi crackers” and can switch their feedstocks based on relative input prices. 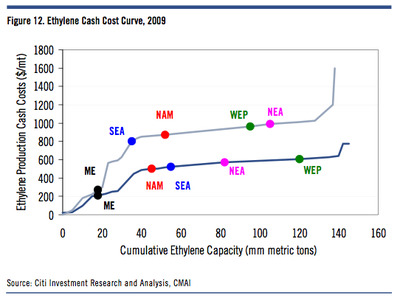 This leads to lower production costs vs. other parts of the world where such low cost feedstock isn’t available. US ethane-based producers remain the most advantaged producers outside the Middle East due to low cost natural gas (see Figure 12).